Red tide has not been present anywhere along the Texas coast since late October. However, shellfish harvesting season is delayed in parts of San Antonio Bay and all of Mesquite, St. Charles, Aransas, Copano and Corpus Christi bays. The bays will be reopened to shellfish harvesting when tests reveal no detectable level of toxin in the shellfish meat. Information about shellfish closures can be obtained by contacting the Seafood and Aquatic Life group of the TDSHS at (800) 685-0361. Red tide has not caused any fish kills or respiratory irritation anywhere on the Texas coast in almost 2 weeks. However, red tides can have lingering effects after the bloom has dissipated. Filter-feeding shellfish (oysters, clams, whelks and mussels) accumulate the red tide toxin in their tissues, where it can remain for weeks. The toxin, which is not destroyed by the cooking process, causes a type of food poisoning called Neurotoxic Shellfish Poisoning. For this reason, shellfish harvesting season is delayed in parts of San Antonio Bay and all of Mesquite, St. Charles, Aransas, Copano and Corpus Christi bays. The bays will be reopened to shellfish harvesting when tests reveal no detectable level of toxin in the shellfish meat. Information about shellfish closures can be obtained by contacting the Seafood and Aquatic Life group of the TDSHS at (800) 685-0361. Red tide has not caused any fish kills along the Texas coast in over one week and all indications are that it is on the decline. However, the Texas Department of State Health Services (TDSHS) has issued a press release regarding a delay in the molluscan shellfish (oysters, clams, whelks, mussels) harvesting season for parts of San Antonio Bay and all of Mesquite, St. Charles, Aransas, Copano and Corpus Christi bays due to red tide. The public is reminded that these shellfish can be toxic even where no discolored water or other evidence of red tide is seen. Information about shellfish closures can be obtained by contacting the Seafood and Aquatic Life group of the TDSHS at (800) 685-0361. Red tide has not caused any fish kills along the Texas coast in over one week and cell counts continue to decline. Padre Island National Seashore reports only very light aerosol and no discolored water along its Gulf beaches. No red tide is visible in Corpus Christi Bay or in the Corpus Christi Ship Channel at the University of Texas Marine Science Institute. Biologists remain cautiously optimistic that recent rains and cooler temperatures have caused the red tide to dissipate. TPWD has received no reports of fish kills this week. Staff of the Padre Island National Seashore report no new fish kills or aerosol irritation, though hardhead spines from previous fish kills remain a concern along the beaches of the National Seashore. Water samples taken yesterday from Corpus Christi Bay near the Texas A&M University campus were free of red tide. Recent coastal rains might have begun to dissipate the red tide, and more rain is forecast for the middle and lower Texas coast through at least Thursday. The overflight planned for this week has been cancelled and there are no plans to reschedule at this time. Patches of red tide are likely still present in areas of Corpus Christi and Aransas bays as well as along the Gulf beaches of Mustang and Padre Island, though TPWD has received no new reports of dead fish or respiratory irritation. Rangers at Mustang Island State Park report that aerosol effects have decreased since the weekend. Water samples taken at the University of Texas Marine Science Institute in Port Aransas contain very little red tide. Samples taken along the beaches of South Padre Island and Boca Chica, from the Port Mansfield jetties to the mouth of the Rio Grande, continue to be free of red tide. TPWD has received no new reports of dead fish or respiratory irritation. Patches of red tide persist in areas of Corpus Christi and Aransas bays as well as along the Gulf beaches of Padre Island. Patches of discolored water were seen today in Corpus Christi Bay near Cole Park but no aerosol or dead fish were noted. Water samples taken in Matagorda Bay and Aransas Bay near Cedar Bayou were negative for red tide. TPWD received no reports of dead fish or respiratory irritation over the weekend. However, we believe that patches of red tide persist in areas of Corpus Christi and Aransas bays as well as along the Gulf beaches of Padre Island. Biologists conducted an overflight of the Texas coast today, flying from San Jose Island to south of the Port Mansfield jetties, observing both the Gulf beaches and the bays for signs of red tide. Many dead fish were seen floating throughout the northern half of Corpus Christi Bay and there were slightly visible patches of red tide in the bay, including one occurring east of the causeway between Corpus and Portland. No obvious accumulations of dead fish or red tide were seen in Nueces Bay. Redfish Bay did not have obvious dead fish or red tide. There were no obvious accumulations of dead fish on the San Jose Island Gulf beach and no obviously discolored water nearshore. Beachgoers and anglers were seen from Port Aransas south to Packery Channel. No obvious red tide or discolored water was seen in the Upper Laguna Madre just south of the JFK Causeway. Dead fish were seen in Oso Bay south of the bridge connecting the university to the naval air station, but it is suspected that these fish floated in from Corpus Christi Bay. 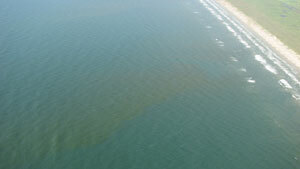 No obvious red tide was seen in Oso Bay. Widely scattered dead fish were observed south of Bob Hall Pier and large dead fish, likely red drum, became common near mile marker 45 of Padre Island National Seashore. The biologists continued to see these large dead fish scattered on the beach as they flew south. No obvious abnormal water color and no dead fish were visible on the Gulf beach south of the south Mansfield jetty. Discolored water and scattered dead fish were seen in some areas of the nearshore Gulf of Mexico. Biologists at the Rockport Marine Lab noticed dead fish (menhaden, pinfish, hardheads) and aerosol in Aransas Pass’ Conn Brown Harbor today. A water sample was collected for red tide analysis. Yesterday’s follow-up of the fish kill and aerosol reported earlier this week near the Port Mansfield jetties showed no signs of a fish kill and no aerosol anywhere along South Padre Island. Water samples were collected along the length of South Padre Island in 5-mile increments, beginning at the Port Mansfield jetties, and no evidence of red tide was found in any of the samples. Biologists collected red tide data around the Corpus Christi area yesterday and reported mild aerosol effects along the bayfront. A large fish kill occurred on Ward Island at the Texas A&M – Corpus Christi campus and mild aerosol was detected. No dead fish were seen along the north side of the JFK Causeway near the channel connecting the Intracoastal Waterway and Packery Channel. The Texas Department of State Health Services (TDSHS) has begun monitoring the bays in preparation for the opening of shellfish harvesting season on November 1. On Wednesday DSHS biologists found red tide at numerous locations throughout Corpus Christi Bay, with the highest concentrations occurring along the Portland shoreline. There was an active fish kill in the Intracoastal Waterway on the north side of the Corpus Christi Ship Channel. Low to moderate red tide concentrations were seen Tuesday in Aransas Bay with the highest occurring on the San Jose shoreline near Allyn's Bight. No red tide was found in Copano Bay or along the Fulton shoreline. Water samples taken this morning at the University of Texas Marine Science Institute are free of red tide and no aerosol irritation is being reported in the area. Biologists are following up on yesterday’s report of aerosol and dead fish south of the Port Mansfield jetties. An overflight is scheduled for Friday which will take TPWD staff from just north of Port Aransas to south of the Port Mansfield jetties, observing both the Gulf beaches and the bays for signs of red tide. Reports came in this morning of dead fish washing ashore along the Corpus Christi Bayfront and North Beach. Biologists are assessing the fish kills this afternoon. Padre Island National Seashore continues to experience an ongoing fish kill, with the highest concentrations occurring between mile markers 20 and 26. Large numbers of red snapper are washed up near the 24-mile mark, and other species seen along the beach include ladyfish, little tunny, king mackerel, jack crevalle, Spanish mackerel, large red drum, Atlantic spadefish, mullet, and numerous hardhead catfish. Large concentrations of dead fish have also been reported between mile markers 58 and 62. Aerosol irritation was present yesterday in varying concentrations all along the beaches of the National Seashore. The good news is that tides are returning to normal, making travel along the beaches less difficult. Mustang Island State Park is also experiencing a fish kill including trout, snook, redfish, menhaden, mullet, and hardheads. Aerosol irritation was moderate yesterday but mild today. TPWD has received a report of fresh dead fish and respiratory irritation on the Padre Island beach just south of the Port Mansfield Jetties. However, high tides are thwarting efforts to obtain water samples for confirmation of red tide. Water samples taken from Galveston, Matagorda Bay, Port O’Connor and Pass Cavallo continue to be free of red tide, and low levels persist at the University of Texas Marine Science Institute in Port Aransas. The dark water seen near Port Aransas yesterday was due to a heavy bloom of the diatom Asterionellopsis glacialis. Red tide was also present in the water samples, which accounts for the aerosol irritation felt in the vicinity of the diatom bloom. Red tide was the cause of yesterday’s fish kill, consisting mainly of mullet, menhaden, and hardheads, at Mustang Island State Park. TPWD biologists working in the Shamrock Cove area of Corpus Christi Bay (near Mustang Island) yesterday observed visible red tide and respiratory discomfort. Water samples taken at Fish Pass, Shamrock Island, and Wilson’s Cut all contained low to moderate levels of red tide. No red tide was visible yesterday in Corpus Christi Bay, from the Corpus Christi Bayfront across the causeway to the Portland shoreline. Birds were seen feeding near Indian Point, indicating red tide is present but not at visible concentrations. Dead fish, mostly mullet and pigfish, were being washed into Nueces Bay from Corpus Christi Bay. However, there is still no evidence of red tide inside Nueces Bay. Patches of dead fish were observed along the shoreline between Indian Point and Portland. Water samples taken in the area are being analyzed. Mild aerosol effects were reported at the south jetty of Packery Channel yesterday. No new dead fish were reported on Padre Island and high tides are washing away some of the old fish. It appears that winds have pushed the red tide north onto Mustang Island again. Though cell counts at the University of Texas Marine Science Institute on the Corpus Christi Ship Channel remain low, a patch of red tide has been observed near beach access roads 1 and 2 in Port Aransas causing coughing and respiratory difficulties. Water samples are being analyzed for red tide concentration. At Mustang Island State Park there were reports of mild aerosol effects yesterday. No aerosol irritation has been reported today. Tides are higher than normal all along the Texas coast this week, at times pushing the water all the way to the dunes and making travel down the beaches difficult at best. Travelers should be aware that, in addition to the high tides, people are having difficulties driving on some beaches due to tire punctures from the spines of dead fish. TPWD received a report of dead mullet, flounder and stingrays seen over the weekend in the Mud Island area of Aransas Bay. Biologists will survey the area and take water samples. No aerosol effects or dead fish were reported in the Port Aransas area over the weekend, and cell counts taken at the University of Texas Marine Science Institute were free of red tide. Fishermen were having success at the Port Aransas jetties over the weekend, landing large redfish, Spanish mackerel, flounder, mangrove snapper, and sheepshead. No red tide has been reported south of the 30-mile mark of Padre Island National Seashore. Red tide is expanding along the Corpus Christi Bayfront. Large patches of discolored water have been reported from the Peoples Street T-Head north to the Port of Corpus Christi entrance and east to Indian Point. No discolored water has been seen in Nueces Bay at this point. Birds were observed feeding over the water near Indian Point on Sunday, but no dead fish were seen. Streaks of what appear to be red tide were seen in Corpus Christi Bay this morning near Texas A&M - Corpus Christi. Red tide and accompanying fish kills continue to be present in the Packery Channel area. Dead fish were seen over the weekend near the seawall and at Padre Balli Park and a significant fish kill was reported along the north shore of the JFK Causeway near the intersection of the Intracoastal Waterway and Packery Channel. The fish kill was primarily composed of pinfish, mullet, hardheads, and some flounder. A local bait stand owner said he’d lost his stock of baitfish on Thursday, and fish began showing up along the shoreline the same day. Red tide effects, including dead fish and respiratory distress, continue to occur along Padre Island National Seashore to approximately the 20 mile mark. Due to the heavy surf and south wind, respiratory affects are being seen at the park headquarters area approximately a half-mile from the beach. Extraordinarily high tides are occurring in the area, which will make any fish kill assessment impossible until they recede. The numerous dead fish are causing many park visitors to experience multiple flat tires (due to punctures from fish spines) and stranding some vehicles. Numerous dead fish, including a number of large redfish and one 91-inch tiger shark, washed up along the National Seashore over the weekend. Recent satellite imagery indicates high levels of chlorophyll, which may be indicative of algal blooms, offshore in the Gulf of Mexico. Biologists are investigating to confirm whether or not this is a red tide bloom. TPWD received a report on Thursday of suspected red tide in the Upper Laguna Madre along the King Ranch shoreline. Weather is hampering follow-up efforts so we ask citizens to please contact TPWD if they see indications of red tide in the Laguna Madre. Red tide persists near downtown Corpus Christi, where blooms are visible along North Beach and the Corpus Christi Ship Channel, near the USS Lexington and the Aquarium, and along the Corpus Christi Bayfront to Cole Park. The bloom continues along the Gulf side of Padre Island. Winds are projected to be blowing from the east or southeast this weekend, meaning that respiratory irritation is likely to be high since the red tide toxin will be blown onshore. Patches of red tide continue to be seen in Redfish Bay, where a few dead fish were observed on Thursday near the terminal. A fish kill consisting solely of mullet occurred Thursday in the canals in Pelican Cove area of Aransas Pass. The fish were likely being blown in from the Hampton Channel area. No visible signs of red tide were seen, but low concentrations were found in water samples. According to the U.S. Centers for Disease Control, scientists know little about how breathing the air near red tides or swimming in red tides may affect human health. People who are near the water during red tide may experience irritation of the eyes, nose, and throat, as well as coughing, wheezing, and shortness of breath. People with existing respiratory illness, such as asthma, may experience these symptoms more severely. If you have concerns or questions about human health effects of red tide or symptoms you are experiencing, please consult a physician. Although some travelers may be concerned with how the red tide may affect their vacation plans, there are miles of clean beaches to enjoy on the Texas coast. To report sightings of red tide during business hours, call your local Texas Parks and Wildlife Department office or the Kills and Spills Team at (512) 912-7055. You may also page Dave Buzan at (800) 299-4099, personal identification number 2366. Weather has forced the cancellation of today’s red tide overflight. Water samples taken today in the South Padre Island area are free of red tide. A bloom has been confirmed in high concentrations at Cole Park near the Corpus Christi bayfront. Large concentrations of seagulls were feeding, likely on fish dying from the red tide, about 100 meters offshore from Cole Park yesterday. Biologists surveyed Mustang and Padre Islands yesterday for red tide-related fish kills. Very few dead fish, all of which were days old, were noted along Port Aransas beaches. Yesterday afternoon biologists received a call regarding dead fish washing ashore at Beach Marker 42 on Mustang Island but have not been able to follow up on the report. Numerous dead fish are present along Padre Island due to an ongoing fish kill. Biologists surveyed from the south jetty at Packery Channel to the Kleberg County line yesterday and found that the majority of fish were mullet, menhaden, and whiting. Croaker, eel, ladyfish and hardheads were also seen, along with a small number of large redfish. Fish kill surveys are continuing today along Padre Island from the county line to the northern boundary of the National Seashore. Patchy blooms continue to move around in the bays near Aransas Pass and Port Aransas. Aerosol irritation has been reported today near the University of Texas Marine Science Institute on the Corpus Christi Ship Channel, where red tide concentrations are persistent but remain fairly low. Irritation was reported yesterday at the Port Aransas public boat ramp as well as along State Highway 35 between Aransas Pass and Rockport. Discolored water was reported yesterday in the Corpus Christi Ship Channel. Visible bloom and high red tide concentrations were recorded Tuesday in Aransas Bay near Allyn’s Bight. Moderate concentrations were recorded Tuesday along the Intracoastal Waterway near the convergence of Aransas and Redfish bays. There is no sign of red tide or impacts from red tide in the water in Lavaca Bay, San Antonio Bay, Ayres Dugout, Copano Bay or Fulton Harbor as of yesterday's reconnaissance by State Department of Health Services personnel. There was no visible sign of red tide along Mustang Island from Port Aransas south to Mustang Island State Park this morning. Dead fish were scattered and appeared to have been dead for several days. There were no fresh dead fish and no signs of respiratory irritation in this reach. Red tide was detected in the water in Aransas Bay along the western shore of San Jose Island, in Cedar Bayou in relatively low concentrations (33/ml) and in the Intracoastal Waterway coming out of Redfish Bay based on water samples collected by State Department of Health Services personnel yesterday, Oct. 10. There are reports of visible red tide in Corpus Christi Bay off of Cole Park from two different sources this afternoon. There is visible red tide along the Gulf beach from Packery Channel south to about one thousand yards south of Bob Hall Pier. This bloom extends from approximately 50 to 150 meters offshore. There are dead fish along the beach and some fresh dead fish are washing ashore at this time. People on the beach are experiencing moderate respiratory and eye irritation on this stretch of beach. There has been one citizen report of dead red drum on the bottom and floating, birds feeding and other fish floating near Bundts Hole and the Klondike about one mile north of Terminal Causeway. Our biologists will investigate that report tomorrow. There will be a department overflight tomorrow as planned earlier. According to the U.S. Centers for Disease Control, scientists know little about how breathing the air near red tides or swimming in red tides may affect human health. People who are near the water during red tide may experience irritation of the eyes, nose, and throat, as well as coughing, wheezing, and shortness of breath. People with existing respiratory illness, such as asthma, may experience these symptoms more severely. If you have concerns or questions about human health effects of red tide or symptoms you are experiencing, please consult a physician. The overflight that was scheduled for today has been cancelled due to weather and has been tentatively rescheduled for Thursday. Cell counts have dropped significantly in Port Aransas at the Corpus Christi Ship Channel near the University of Texas Marine Science Institute. No aerosol effects have been reported in the Port Aransas area. Padre Island National Seashore staff were notified on Sunday of severe respiratory effects and dead fish washing ashore along the first few miles of the park. As of this morning reports indicate red tide from the park’s northern boundary to approximately 30 miles beyond the end of Park Road 22. The most severe aerosol effects and numbers of dead fish are being seen from the northern boundary to 10 miles south of Park Road 22. The southern movement of the red tide that was reported on Friday continued through the weekend, with anglers reporting discolored water and aerosol irritation along portions of Mustang Island to the 13-mile mark of Padre Island National Seashore. Dead fish, mostly mullet, were seen along the Gulf beaches on Sunday from Port Aransas to the 8-mile mark of the National Seashore. No reports of irritation or fish kills in the Cedar Bayou area came in over the weekend. In addition, red tide has not been found in Rockport, Port O’Connor, Corpus Christi, the Laguna Madre, Port Mansfield or South Padre Island. TPWD is conducting another overflight of the coast on Tuesday. Biologists will fly from Mesquite Bay to South Padre Island to get an aerial view of the red tide. Staff from TPWD and Padre Island National Seashore will resume collection of water samples on Tuesday to be analyzed for red tide concentration. TPWD completed an overflight of the Texas coast this morning looking for patches of red tide. A substantial bloom was seen along the north jetty at Port Aransas extending out to the first buoy offshore past the jetties. Also seen was a line of dead fish in the water associated with bloom that included 10 large redfish. A large patch of red tide was noted at the north Matagorda Island jetty that extended from the beach to near the end of the jetty. Patches of red tide were seen 200–300 meters offshore scattered from just south of the Matagorda jetties all along Matagorda and San Jose Islands to the Port Aransas jetties. Dead fish were seen today on Matagorda Island north of Cedar Bayou, but it is not clear how far north the dead fish extended. There were also dead fish along the entire length of the San Jose Island Gulf beach, and biologists are currently assessing this kill. A possible bloom was noted in Conn Brown Harbor as well as in Redfish Bay north of the Hwy 361 Causeway extending to Corpus Christi Flats to near the Corpus Christi Ship Channel. Streaks of red tide were also seen in the Redfish Bay State Scientific Area. One other patch of red tide was seen in the area of Shamrock Island, including East Flats to the north and Mustang Island to the east. No visible red tide was seen along the Gulf of Mexico side of Mustang Island, however, TPWD has begun to receive reports of respiratory irritation occurring at Mustang Island State Park. No red tide was seen along the Intracoastal Waterway from Rockport Marina and Fulton Harbor to Mesquite Bay. Biologists report numerous fishermen catching fish today in Redfish Bay (south of the Causeway) and no respiratory irritation or dead fish in Redfish Bay and Aransas Channel. Water samples taken yesterday at Padre Island National Seashore show no evidence of red tide on either the Gulf or the Laguna Madre side of the island. Likewise, water samples taken from San Antonio Bay are free of red tide. A sample taken yesterday at the Corpus Christi Ship Channel between channel markers 9 and 10 contained moderate levels of red tide, but the sample taken at Cedar Bayou contained much lower levels compared to earlier this week. Biologists surveyed the Port Aransas area yesterday and found patches of red tide at various locations within the Corpus Christi Ship Channel, Lydia Ann Channel, Redfish Bay, and the Inner Harbor. 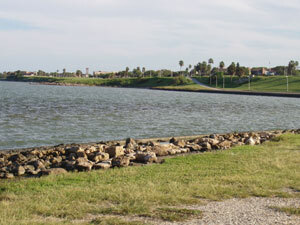 A large area of red water was seen in the Corpus Christi Ship Channel stretching out from channel marker 10 past the end of the jetties into the Gulf. Moderate aerosol irritation was reported in the Ship Channel and at San Jose Island, and mild irritation in Lydia Ann Channel and the Inner Harbor. A number of fish kills have been reported in the past 24 hours. Hardheads were observed dying in the Corpus Christi Ship Channel between markers 9 and 10. A small fish kill was reported on the Port Aransas beach just south of the jetties. A marina in Ransom Channel was the site of another reported fish kill; biologists went to Ransom Channel today but found no discolored water or dead fish. TPWD biologists came upon 3 dead redfish, all over 3 feet long, in Corpus Christi Channel along the back side of Mustang Island yesterday. In addition, reports came in of about a dozen large redfish dying at the Port Aransas jetties. The University of Texas Marine Science Institute received an anecdotal report of discolored water and dead flounder in the Laguna Madre yesterday. However, no specific location was given and we have been unable to follow up on this report so far. Red tide continues to persist in the Corpus Christi Ship Channel at Port Aransas near the University of Texas Marine Science Institute. Low levels of red tide were found yesterday at Pass Cavallo and at the Matagorda Ship Channel jetty. Respiratory irritation was reported yesterday from Conn Brown Harbor in Aransas Pass to Rockport. TPWD received a report yesterday of a fish kill in Redfish Bay north of the Terminal Causeway consisting mainly of gulf menhaden. Biologists surveyed Redfish Bay today and found no dead fish and no visible sign of red tide. Red tide surveys have been conducted along many portions of the Texas coast. No evidence of red tide has been found in Galveston Bay or the South Padre Island area. In addition, no red tide has been reported along the gulf beaches of Mustang and Padre Islands. This morning TPWD flew over a portion of the Texas coast, observing a visible but patchy red tide bloom on the gulf side of San Jose Island north to Cedar Bayou. Red tide has been found at various sites in Corpus Christi Bay and Aransas Bay, including La Quinta Channel, Lydia Ann Channel, and Cedar Bayou. Red tide is also present in the Corpus Christi Ship Channel at Port Aransas near the University of Texas Marine Science Institute. Water samples taken yesterday in the Corpus Christi Marina were free of red tide. Biologists surveyed the fish kill at Cedar Bayou yesterday and noted that all the dead fish were a few days old. No new dead fish were seen, but aerosol effects were reported at the western shore of Cedar bayou and on the gulf beach of Matagorda Island. Reports of red tide-related fish kills and respiratory irritation came in over the weekend. On Friday night a fisherman observed a fish kill consisting mainly of spot and pinfish, but also including flounder and snook, at Cedar Bayou. On Saturday morning discolored water and respiratory irritation were reported in Mesquite Bay to Carlos Bay and Spaulding Reef. A second report was received of a small fish kill including trout, redfish, black drum, hardheads, and lots of menhaden along a two-mile stretch from the junction of Cedar Bayou and Mesquite Bay towards the Gulf. Dead fish were observed on San Jose Island extending north to Cedar Bayou and onto the Matagorda Island shore on Saturday. The fish kill, which was a few days old, included gulf menhaden, mullet, Bermuda chub, ladyfish, and red drum. Aerosol effects were also reported. TPWD has numerous staff following up on the reported fish kills, as well as sampling the central coast to determine the extent of the red tide bloom. No discolored water and no stressed or dead fish were observed along the north shore of Corpus Christi Bay including La Quinta Channel, the north shore of Redfish Bay, Conn Brown Harbor or the Aransas Channel. Biologists are still conducting their sampling at this time. Red tide concentrations at the University of Texas Marine Science Institute in Port Aransas dropped significantly over the weekend and today. No aerosol effects have been reported today in Port Aransas. An overflight of the coast is scheduled for tomorrow morning, which should allow TPWD to get an aerial view of the bloom. A red tide bloom has been confirmed in Port Aransas near the University of Texas Marine Science Institute on the Corpus Christi Ship Channel. No aerosol effects have been reported in Port Aransas. Dead menhaden were found in the university’s boat basin, and distressed menhaden have been reported in East Flats. A fish kill has also been reported in La Quinta Channel. There is no evidence at this time that there will be a major bloom impacting Texas beaches. We will continue to monitor the situation. Red tide has not caused any fish kills or respiratory irritation anywhere on the Texas coast since November 2005. Information about shellfish closures can be obtained by contacting the Seafood and Aquatic Life group of the TDSHS at (800) 685-0361. Red tide has not caused any fish kills or respiratory irritation anywhere on the Texas coast since November 2005. TDSHS has opened the oyster harvesting season in Aransas Bay (including St. Charles Bay and Carlos Bay), Corpus Christi Bay and the Laguna Madre including South Bay. Information about shellfish closures can be obtained by contacting the Seafood and Aquatic Life group of the TDSHS at (800) 685-0361. Still no red tide, but the Laguna Madre and Corpus Chirsti Bay remain closed. TDSHS states that the oyster harvesting season is delayed in Aransas Bay, Corpus Christi Bay and all of the Laguna Madre including South Bay. TDSHS reminds the public not to harvest and eat oysters, clams, mussels or whelks from Texas coastal waters while red tide is present. Information about shellfish closures can be obtained by contacting the Seafood and Aquatic Life group of the TDSHS at (800) 685-0361. Red tide has not caused any fish kills or respiratory irritation anywhere on the Texas coast since early November 2005. TDSHS has opened the oyster harvesting season in Aransas Bay (including St. Charles Bay and Carlos Bay), but the season remains delayed in Corpus Christi Bay and the Laguna Madre including South Bay. TDSHS reminds the public not to harvest and eat oysters, clams, mussels or whelks from Texas coastal waters while red tide is present. Information about shellfish closures can be obtained by contacting the Seafood and Aquatic Life group of the TDSHS at (800) 685-0361.